One thing you can say about lightning – it’s not very subtle. Geomorphologist Stephan Grab and Geologist Jasper Knight at Johannesburg’s University of the Witwatersrand in South Africa have studied the Drakensberg Peaks in Lesotho and discovered the primary force shaping them is lightning. They studied 90 sites where lightning blasted away basalt rock faces, leaving pits up to three-feet deep and scattering ten-tons of debris. They found lightning shifted boulders as big as small trucks. Their research is published in the January 1, 2014 issue of Geomorphology. Their findings contradict the standard belief that ice and heat are the main forces shattering rocks on the Drakensberg Summits. Lightning can generate temperatures over 52,000ºF (30,000ºC). Hot enough to create an explosion, instantly melting basalt and vaporizing water in rock pores and fissures. Lightning may be positive or negative in polarity, depending on where it originates in the cloud to ground discharge. 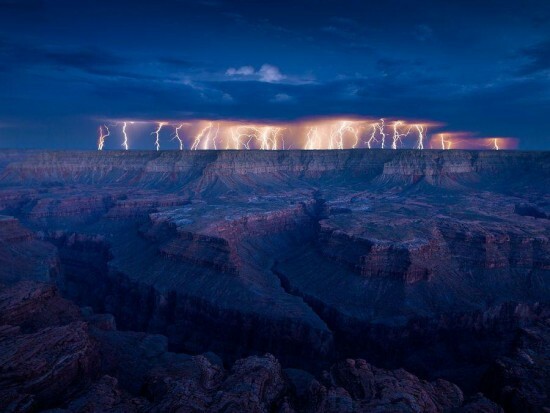 Negative strikes are from the negatively charged cloud-bottom to ground, whereas positive strikes connect the anvil cloud-tops to ground. Positive lightning occurs only five percent of the time, but carries five to six times the current and voltage of a negative strike. Lightning also leaves behind an indelible magnetic signature, which makes finding past strikes fairly easy. Even paleo-lightning strikes have been identified by archaeologists. One group in Nevada found a lightning bolt petroglyph thousands of years old and used a magnetometer to ascertain the rock had actually been struck, and that the paleo-Indian who witnessed it faithfully recorded it’s shape. Ironically, lightning is also believed to deposit manganese and other minerals on rock surfaces, producing the patina rock artists chipped away to form petroglyphs of the type Dr. Anthony Peratt recognized as depictions of aurora plasma discharge. Lightning-zapped rock exhibits vitrification from heat and can be covered in natural glass called lechatelierite, melted quartz that forms the foamy, glassy interior of fulgurites. In a new study, researchers found “shock lamellae” beneath the glassy quartz – a thin layer of warped quartz crystals – induced by the high pressure of the strike. The warped layer consists of parallel straight fractures revealed under intense magnification. To create these shock lamellae, researchers calculate a force of 10 gigapascals. The only other event that creates such force, and leaves shock lamellae is believed to be a large meteorite impact. This is another similarity between an electrical event and a meteor, or comet impact that makes them hard to distinguish. Not only does lightning shape mountains, but it shows preference where it strikes. H. Roice Nelson of the American Association of Petroleum Geologists (AAPG) and colleagues have discovered strikes cluster in patterns that repeat over time. He correlated strike patterns obtained from the National Lightning Detection Network with geologic and mineral exploration maps, and found compelling correlations with Telluric currents in the Earth and the presence of conductive materials. Magnetometers are typically used to find a lightning strike. It will show a dipole anomaly, usually at higher strength than remnant magnetism from other causes. Next year, NASA intends to send the Insight mission to Mars for geologic and tectonic evaluation of the planet’s structure and formation. It will carry a magnetometer to investigate patterns of lightning activity. This provides an opportunity for EU theorists to make predictions. Imagine the surprise when data comes in. 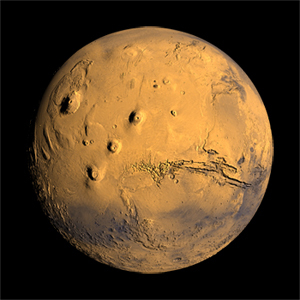 Will there be a giant swirling dipole surrounding Valles Marinaris? The polarity pattern around Olympus and the Tharsis Mons might be similar to a washing machine plug because that is what they look like. Breccia pipes exist by the hundreds on the lower Colorado Plateau, from the Arizona strip north of Grand Canyon to the edge of the Mogollon Rim. Originally interpreted as volcanic artifacts, the breccia pipes are now considered to be solution-collapse formations — essentially, sinkholes caused by water dissolving a deep layer of subsurface limestone. Overburden collapses leaving a vertical pipe filled with broken rock. Some are as deep as 1,800 feet and 200 to 400 feet in diameter at the surface. They appear as a round surface feature of reduced vegetation, discoloration, and either a slight mound, or hollow over the actual pipe. Around the pipe, the ground is typically slumped in concentric circles enclosed with a raised rim, although some are flat ground and hard to detect at all. 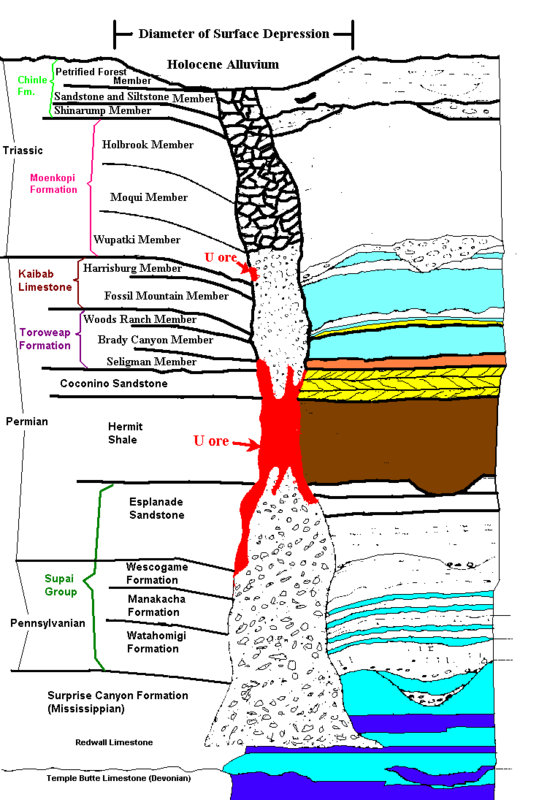 Three types of sinkhole exist in the region, differentiated by the type of karst formation that formed them, producing different depths, ages and other properties. Of interest to these researchers were mineral bearing formations in breccia pipes thought to be the result of solution-collapse of the Mississippian Redwall Limestone. These breccia pipes may have commercial ore deposits of high grade uranium, copper, zinc and other minerals. These formations of northern Arizona yield the most compact source of high grade uranium in the United States and are extensively mined. The thrust of the article, however, was the use of magnetometers to find the breccia pipes since they were found to exhibit dipole anomalies. The magnetic anomaly is typically at the surface, over the cemented breccia chimney itself, and can extend into the pipe fifty-feet or more in depth. The authors did not perform extensive below ground testing. All of this brings to mind the work of Micheal Steinbacher and some of his ideas regarding the geology of the Four Corners region, in particular, the Grand Canyon where breccia pipes appear in clusters and alignments. 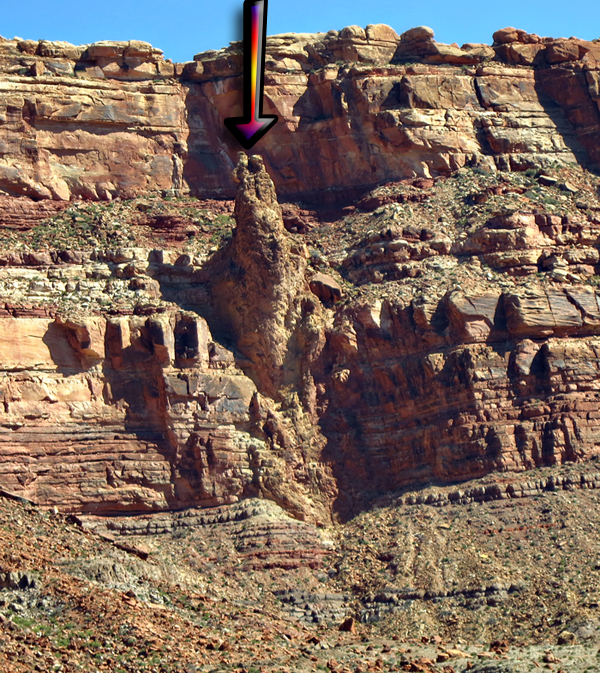 Many of them are concentrated along the canyon walls, especially on the South Rim, where some are exposed — sliced open on one side by the canyon — providing a vertical cross section of the entire pipe. There is nothing implausible to the idea that these are karst formations. Water will dissolve limestone and create a sinkhole, and these pipes are apparently filled with what sloughed off the walls. What is curious is how they cluster on the South Rim, where the plateau dips away from the canyon. Pipes should cluster farther south where the water flows. The other concern is the minerals, including high grade uranium and varying amounts of a wide range of commercial metals. The breccia pipes contain bitumen in pores and fissures. They exhibit extensive oxidation deep below ground. They have concentric rings surrounded by a raised rim like a crater. And there is the magnetic dipole. All of these features imply an electric formation. The researchers speculated that the magnetic anomaly was from breccia fill from the Moenkopi formation, which has a slightly higher natural magnetism than the surrounding rock. In some cases, they felt the mineral deposits themselves might also contribute to the anomaly. The notion that these could be artifacts of thunderbolts would almost have to be in Micheal Steinbacher’s theory of canyon formation. He postulated a plasma discharge locked to the bedrock of the river below, while the plateau built around it, leaving the canyon behind. In that scenario, the breccia pipes may be the artifact of huge ground currents from the discharge in the canyon that followed the Redwall, and looped upward to atmosphere, cleaving side canyons, and exiting the ground, leaving these giant holes. If so, a study of the morphology of the breccia pipes could yield features particular to such an event that would inform future investigations. If the canyon was formed electrically, these pipes were likely formed electrically too, which may tell us something about the current that made them.